A knot is a closed loop of string in space. Suppose you have a knot $K$ and you lay it flat on a table. How many crossings do you see? This could depend on how you lay the string down. 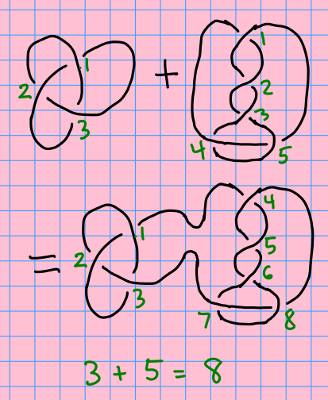 The smallest number of crossings you can get for that knot is called the crossing number of $K$, which we write with the notation $c(K)$. Now, take two knots $K_1$ and $K_2$ and put them side by side. Splice them together by cutting each one open and gluing the ends of the two knots together to make one closed loop. 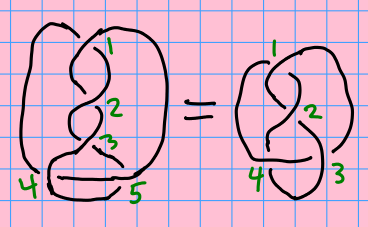 This is called a knot sum, which we'll write $K_1+K_2$. Here is the question: Is it true that, for any two knots $K_1$ and $K_2$, $c(K_1+K_2) = c(K_1)+c(K_2)$?